← From Leader to Leader – Pastor you are SOOOOO Appreciated! Search for Certainty—This series is made up of 30 lessons newly updated and prepared by well-known evangelist and soul winner, Mark Finley. The lessons cover all the major Bible doctrines and answer the most common questions individuals have about the Bible and its teachings. Also available in Spanish! Breath of Life—The Breath of Life series consists of eight lessons dealing with such themes as the origin of sin, God’s grace, the plan of salvation, the new birth, the second coming of Jesus, heaven, etc. This series is ideal for use as a concise summary of the principle doctrines of the Bible or as a “refresher” course for students who would benefit from reviewing the basics. Good News Tracts—There are 33 tracts in the Good News series, covering the great truths of God’s Word in a compact, effective presentation. Each tract has four pages and is ideal for giving to family and friends who have expressed questions or interest in a particular topic. Good News for Today—This series of Bible lessons is great for studying with individuals or for use with small-group studies. They address a variety of topics in a way that is direct and to the point. Each lesson is 6 pages and is punched to fit a three-ring binder, allowing you to organize them for fast, easy reference. Prophecies of Hope—The Prophecies of Hope series contains 26 full-color, full-message Bible lessons developed by Gary Gibbs, president of Pennsylvania Conference. The “fill-in-the-blanks” feature fits people’s busy lifestyle today. Faith of Jesus (Spanish)—For many years, this baptismal manual has been the most common set of Bible lessons for children used in Hispanic churches. Now it has been redesigned and is available in full color. A Reason to Believe—This is a series of doctrinal lessons designed to prepare young people for baptism. The series boils down the SDA fundamental beliefs to 10 lessons. Young people can study these lessons on their own or with a friend. They are also designed for young people to study in baptismal classes or with their youth leader or pastor. Whether you’re young or simply young at heart, you’ll find these lessons inspiring, creative, challenging, and meaningful. It’s My Choice is an age-appropriate baptismal study guide package for Juniors and those who are helping them prepare for baptism. These are not revamped “adult” studies, but lessons created specifically for the concrete thinking of 10-to-12-year-olds––the most common age of baptism in the Adventist Church. Bible Adventures for Young Readers—This Bible study set uses a creative, kid-friendly approach to the 28 fundamental beliefs, which will introduce young children to the basic doctrines of the Adventist Church. Using its easy-to-understand format and interactive approach, children will quickly grasp the Bible concepts and have fun learning. Bible Adventures for Young Readers is an excellent resource for Primary-aged children to study on their own or with their parents in preparation for baptism or in Sabbath Schools and Bible classes. How to Give a Bible Study by Kurt Johnson. This booklet will show you step-by-step how to study the Bible with interested individuals and groups. Studying Together, by Mark Finley—This pocket-sized Bible handbook is packed with information to assist you in studying the beautiful Christ-centered truths of the Bible with your friends and neighbors. It is divided into three main sections: Bible Studies You Can Give; Practical Christianity; Understanding Churches, Denominations, and Other Religious Groups. Also available in Spanish! What the Bible Says About . . . by Lonnie Melashenko—What the Bible Says About . . . contains two powerful aids to Bible study in one compact package. 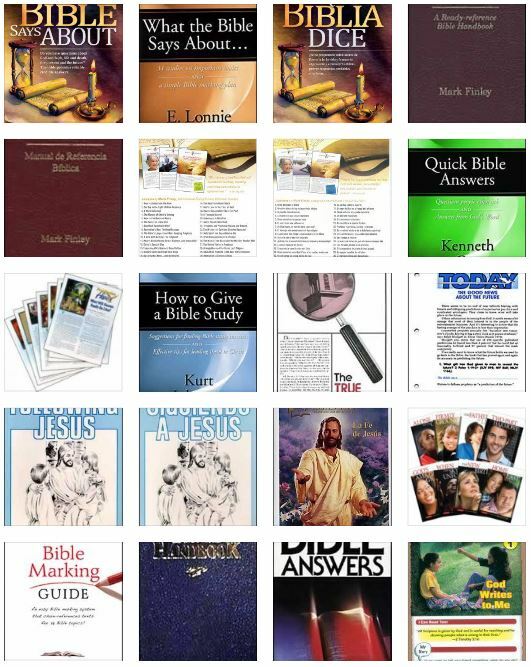 First, there are 31 actual Bible studies on major important Bible topics. Then there is also an easy-to-use Bible marking plan that will help you transform your own Bible into a virtual encyclopedia of biblical information that you can share with others. By using this simple, color-coded plan, you can follow key subjects throughout your Bible, learning and teaching what God’s Word has to say about each important issue. Bible Answers—Fifteen chapters are drawn from Bible Readings to make a concise but complete topical study of the Bible. Bible Handbook—classic Adventist booklet by S. N. Haskell, This pocket-size handbook contains outlines for 220 Bible studies. Bible Marking Guide—by Evangelist John Earnhart. This guide outlines an easy Bible marking system that chain-references texts for 38 different topics. Using only your Bible, you can share the life-changing answers to questions about important spiritual matters. Additional notes are included to help you explain difficult or complex subjects. What the Bible Says About—by Mark Finley. It is especially designed to give you answers directly from Scripture. Use either as a reference, or as a special gift for those with whom you are studying. Also available in Spanish!